Like her mom, my kid is great film-freak. 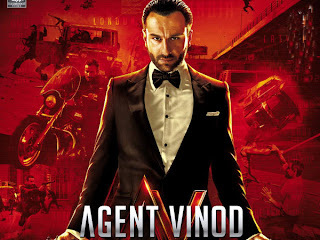 As hubby had reservations about our little one being taken to Shirin Farhad Ki Toh Nikal Padi (U/A) & From Sydney with Love (U/A), Joker was one of two (U) films available this Friday, August 31, 2012, the other being ‘I Am 24’. 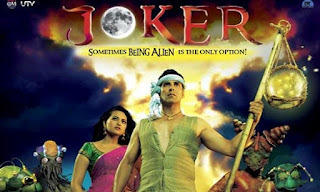 My kid and her friend chose Joker, Akshay Kumar’s 100th film. What or who is Joker? No, not Batman’s arch enemy, not the British comic-strip, not even the ‘jester, jokester, fool, wit-cracker, or prankster’ employed in Circus to tell jokes! Joker is a special type of playing card found in modern decks. As per Wikipedia, in card games, the Joker's use is varied. Many card games omit it from use entirely. Sometimes, Jokers are simply used as replacements for lost cards in a deck. Some games accord it importance. Often, the joker is a wild card, and thereby allowed to represent other existing cards. The Joker can be an extremely beneficial or an extremely harmful card. Here, Joker refers to the village of Paglapur, with a population of 600 inhabitants…cut-off from the rest of India as it’s not on the map, having been abandoned by a British surveyor in 1946. Joker is orphaned by the present three bordering Indian states (MP & Rajasthan were two. Which was the 3rd?) As Agastya says, ‘Joker Jiska hua, baazi usiki!’ (Joker owner will be the winner) ‘Yeh joker aisa punter, Jo khele baazi khud par’. For your IQ, Agastya is one of the Saptarishis ("seven sages" extolled in the Vedas) and the author of Agastya Samhita; -Agastya is a name of Shiva too; -A-ga means a mountain, and Asti means thrower. ; Agastya is also the Indian astronomical name of the star of Canopus, is said to be the 'cleanser of waters', since its rising coincides the calming of the waters of the Indian Ocean. He was son of Pulasthya, son of Brahma. 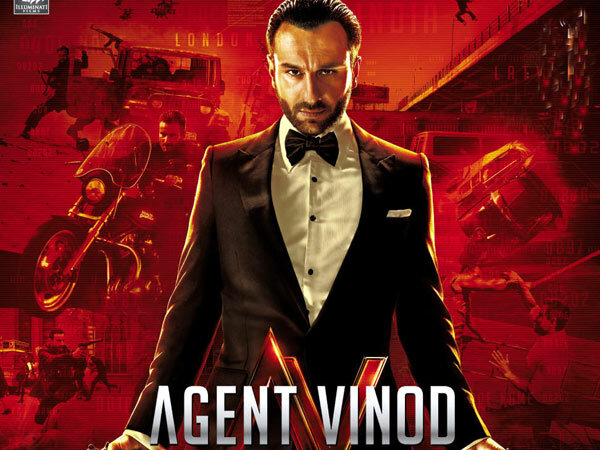 Agastya (Akshay Kumar) is a US-based scientist who lives with his girl-friend, Diva (Sonakshi Sinha). Agastya has built ‘the most sophisticated’ instrument to communicate with aliens. With a 1-month-ultimatum to prove ‘results’, he and Diva visit Paglapur, Agastya’s village after his brother Babban’s (Shreyas Talpade) call that his father (Darshan Zariwala) is ill. Agastya discovers the reality soon and plans metamorphosis of Paglapur’s status from ‘unwanted’ ignominy to ‘sought-after’, wooed by 3 CMs! Aiding him are the happy-go-lucky Paglapur-residents. They design a crop-circle that catapults Paglapur into radar. The great-Paglapur-Tamasha begins! Night-active desi-aliens manage to sustain interest. They befool all the media and politicians with elan, but for American scientist, Simon (Agastya’s rival)! To quote Abraham Lincoln, ‘You can fool all the people some of the time, and some of the people all the time, but you cannot fool all the people all the time’. Their ‘hoax’ is soon discovered. Fraud-earned electricity and water-supply are scrapped. But, all ends well when a real alien in a UFO leaves behind a ‘gift’ after visiting Paglapur. The alien proves that our hero’s gadget had been ‘working all along for the last 2 years’! NRI scientist reigns again! This simple story set in innocent Paglapur reminds one of scenes from the movies- Swades, Lagaan, Peepli Live, Deewar and Koi Mil Gaya. Shirish Kunder really loves the name Agastya. Incidentally, Akshay Kumar’s name was Agastya in Kunder’s first directorial venture, Jaan-E-Mann. Kunder also loves NRI scientists. Akshay Kumar also played an NRI scientist in Jaan-E-Mann. How does Babban manage to make an ISD call to Agastya’s home, when they have no phone connection in their village? Had someone sneaked in a cellphone from across the border? If Babban had indeed made the call to inform & invite Agastya to India, how did Diva understand his language? Agastya was the only one who could interpret Babban that too with sign-language! After arriving in Paglapur, Agastya strolls at a leisurely pace to his home, interacting with key-characters on his way as if he had all the time in the world, though his father is ‘beemar aur kuch hi dino ke mehmaan.’ Not once does he hurry, though the Paglapur public keeps reminding him exactly that! Paglapur school-children duck for cover whenever an aeroplane passes. Their Masterji (Asrani) screams ‘German! Hitler!’ still believing World War II to be on! Surely, Agastya could have & should have changed this fallacy years ago- before catching the flight to USA. Chitrangada Singh’s Kafirana item-song has superbly rendered English lyrics- “I want just you, I want just you, Baby I want just you!” How did this chamatkaar happen with such a Masterji?! With such a damsel around, you can’t blame if Paglapur’s public lives up to its name- becoming paglas! Paglapur has a new Dam in the vicinity but a 65-year-old disfunctional post-office. Agastya’s assurance ‘Sab theek ho jayega’ (All will be well) is greeted with loud cheers! One of the Lagaan-tunes plays in the background, to bring about the obvious connection. Agastya and Diva watch news using his laptop. How did they charge it in this village-without-electricity? Perhaps, laptop was solar-energy-compliant. How did the 600 Paglapur citizens bathe, wash clothes and cook if there was no water-supply and the river had dried up? Ponds, wells and tube-wells, right? ET communication is more powerful than local communication. An alien helps Paglapur to identify its hidden potential. Then, only the village believes in what has been their natural gift all along. Though Lord Fawkland states it earlier, no one, including Agastya, believes him! Lesson- If you don’t listen, check out & learn the true-story at home, be prepared when a foreigner comes to teach you the same! Didn’t the media look for the aliens in Paglapur during the day? They seemed ready only for the night-action! Our media is so efficient that they would have done the ‘khulasa’ about Paglapur being oil-rich, rather than an alien doing the same! Why is Diva his live-in partner for the past ‘4 years’, why not his wife? Living-in is fine, but not marriage without family approval? 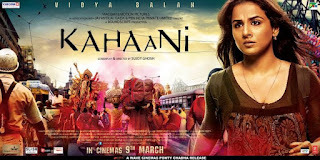 Team-work wins - Incorporating team-concept like in ‘Lagaan’, even the number of key-players in ‘Joker’ is 11 (Agastya, Diva, Babban, Pitaji, Masterji, Lord Fawkland, Rajaji, Vrajesh Hirjee’s character, Vindu Dara Singh’s character, ‘Lalten’ kid & Hunchback character!) Add Tanya and her camera-man, and you have 13! Hard-work and dreams count – Anyone can work hard and rise like this boy from Paglapur- walking miles to school & then becoming a high-flier. Once in the USA, he sets his eyes skywards to reach the aliens, and what’s more, he succeeds. Realistic sets - Joker has an amazing down-to-earth, old & antique look and feel. I was reminded of ‘Adventureland’ in Disneyland, Hong Kong. The Great-Paglapur-Tamasha – Seems like a circus or mela out to entertain all! Loved the mad-media-reactions to the crop-circle! Local Pagal-Khana (Paglapur Mad Hospital) is transformed into Paglapur-Lodge overnight to host the media at Rs 200 per room! Co-existence of Sophistication & Ancient Rituals – Crop-circle Surveys & Yagya by Sadhus! Farah Khan in a guest appearance – Directing a song to cash in on the crop-circle! Babban’s chemistry with Tanya- Especially, the first scene when he saves her from the rain by removing the latter’s news-van’s dish-antenna, for use as an umbrella! Love knows no language! Mr. Simon getting ‘abducted by aliens’! Babban’s Temple soliloquy- Emotional outburst in the temple (akin to Amitabh Bachchan’s in Deewar) that gets Agastya’s machine to communicate (akin to Hrithik Roshan’s in Koi Mil Gaya) with aliens! Aliens have their eyes on us – Be careful on what you do & how you dance! An alien might just be learning dance-steps from you! 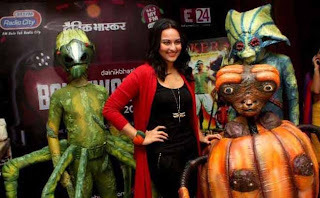 Everyone will love the real alien’s thumka! -Joker was initially intended to be a 3D-film for kids. -You will be happy to see them enjoying the film. -Laughter is infectious. You end up laughing with them. -They will be delighted by the light-emitting-veggie-wonders- the desi-aliens providing general entertainment when darkness descends! - Neat & clean family-entertainment- not one kissing scene or mindless violence & gore. - They will love the Alien & UFO in the climax. Don’t listen to critics! Just go and watch Joker with your family and kids!